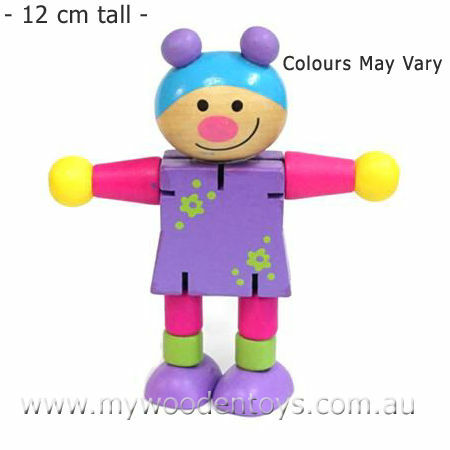 Wooden Bendable Doll has her arms, legs and head attached to elastic so you can pull her apart and adjust her position. The elastic is connected to the body so you can't loose any of her parts. Bendable doll can end up in some crazy positions and is a great toy for helping with those fine motor skills. Very solid with heavy duty elastic this toy will cope with hours of rough play. A beautiful multi-coloured creation with a happy smiling face. Material: Wood, Elastic, Child -safe paint. We like this because: "It's simple, fun and a great toy to take with you to keep little ones occupied when you go out."